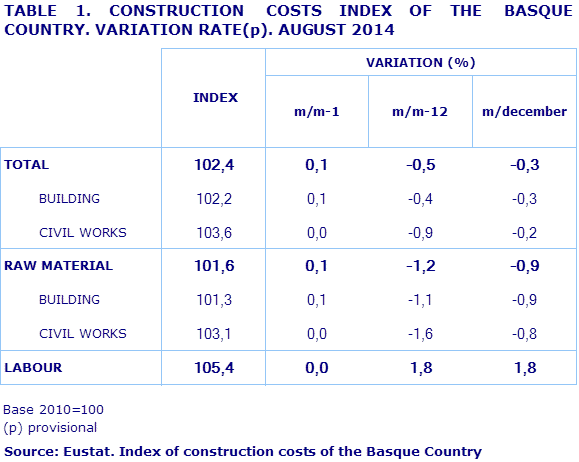 There was a 0.1% rise in the Construction Costs Index of the Basque Country in August 2014 compared to the previous month, whilst in year-on-year terms it decreased by 0.5%, according to data provided by EUSTAT. There was no variation in labour costs, 0.0%, with regards to the previous month, whereas raw material costs rose by 0.1%. In August, the sub-sectors of Building and Civil Works showed a somewhat different evolution in the cost of their raw materials in relation to the previous month, with a rise of 0.1% in Building, while the cost of Civil Works remained stable at 0.0%. The year-on-year performance of both sub-sectors showed the same figures. Building raw material costs fell by 1.1%, whereas those for Civil Works recorded a 1.6% decrease on the same month of the previous year. The prices of raw materials consumed by the sector that recorded the biggest increases in their year-on-year prices (August 2014 on August 2013) included those in the sectors of Electricity & Gas, which was up by 2.7%, and theTimber Industry, with a rise of 2.1%, and the Chemical Industry, which rose by 0.6%. On the other hand, sectors that saw the biggest price reductions over the last twelve months in raw materials include the sectors of Oil Refining, with a decrease of 5.3%; Non-Metallic Minerals, which fell by 2.8%; and Plastic & Rubber, which was down by 1.0%.